The Savonia withstands extreme heat and needs little care and maintenance. It can easily be installed as it is provided with adjustable legs that stand on the floor. All metal parts of the heater are stainless steel. This Savonia heater is operated with a separate control panel. It can heat around 50 kg of stones. 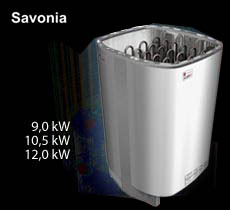 Savonia model is available in 9,0 kW, 10,5 kW and 12,0 kW.